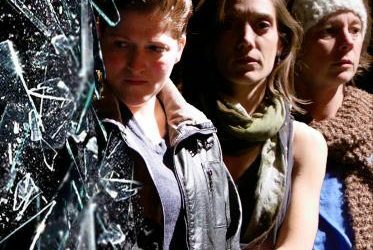 Premiering last night at Theater Schmeater in Belltown, Stef Smith’s Swallow follows the intersecting lives of three people who suffer similarly, each experiencing piercing isolation impressed upon them by a society in which they are unwanted. Nonetheless, director Julia Griffin offers a glimmer of hope that such alienated individuals can achieve peace and rehabilitation through self-acceptance and honest communication in an otherwise bleak world. The play opens on Anna (Jasper Katie Driscoll), Sam (Jasmine Joshua), and Rebecca (Mahria Zook) struggling with their own problems, respectively, separate of each other but not in entirely dissimilar situations. Anna reveals she hasn’t left her apartment in nearly two years and spends her days vandalizing her living space and restricting herself from contact with the outside world. Meanwhile, her neighbor Rebecca is exposed to wrestle with anger and frustrations over her long-term ex, who has recently become involved with another woman, and Sam tries to begin smoking while making other efforts to appear more masculine, which is how he self-identifies. With every passing day, each of them grows more and more isolated until their lives become inextricably intertwined after Rebecca meets Sam, and then later implores Anna for aid in an unrelated incident. As Sam and Rebecca try to provide help to an unwilling Anna, their relationship gradually becomes romantic, though trouble arises after Sam is willfully negligent about his gender identity, failing to be open and honest with Rebecca about how he identifies. Anna’s depraved behavior peaks in intensity, culminating when an injured white pelican (Kendra Pierce) appears at her window and she adopts it. While she attempts to nurse her new avian friend back to health in the solitude of her apartment, Sam and Rebecca must decide if they can forgive each other’s previous actions and move forward, either separately or together. Performed in a blackbox theater on a thrust stage of sorts, the set design is minimal and most effective. Polygons are painted grey upon one wall as a representation of Ana’s ongoing projects, a mosaic pattern reflective of the broken glass that’s often associated with each character throughout different parts of the play. Frequently moved by the actresses onstage is a wheeled, wooden frame, divided vertically into thirds and functioning in various scenes as walls, windows, doorways, and seating. Considering the intimacy of the performance space, the overall lack of furniture and props works to the play’s advantage, allowing for the cast’s captivating performances to retain the undivided attention of the audience. D. R. Amromin’s sound design greatly enhances the onstage action as well, ranging from subtly setting a scene’s tone to the explosive crashes of cymbals every time glass is shattered by a character. Surely a beacon for anyone who has ever felt alienated and alone, this must-see show reassures that to be lonely is to be human, while proposing a little acceptance and pride in one’s inherent imperfections can go a long way at making life’s little miseries easier to swallow.